But “there is no such thing as coincidence” and “there is no changing what is meant to be.” So I must accept this. Paths do not come to you. You have to find them for yourself, and sometimes, you have to carve new ones entirely. Some authors sound amazing on paper and turn out to be somewhat of a disappointment in the person department, others might not live up to their persona in the writing department … and then there are authors like Susan Dennard who are not only great people but also really, really good authors where you feel that each scene and each word has been weighed and measured for its impact and function and whose world building and character development are on point. This book is part of the Witchland series (which joy of joys – truly, I couldn’t let this go – is not a trilogy) and serves as a sort of prequel that should, however, not be read before the first book even though that would be chronologically correct. This book is illustrated with maps and sketches, there are handwritten annotations and pages that look like inserted scraps, and because my copy has rough cut or deckle edges it really feels and looks even more like the journal it is supposed to be. I loved getting this deep and personal connection to Ryber and others by reading their thoughts (as opposed to the two main books where the narrator is not first but third person) and the parallel narration of two timelines was in my opinion very cleverly done. Ryber’s character growth has especially resonated with me in her quest to find out what is going on while also figuring out her own path. I’m a bit more reluctant than Ryber to use the word destiny even though I also don’t think that it’s all coincidental. With all this new information and background I feel that I should read the two main books again before the third comes out. And maybe make a map or chart of connections and points of interest … because if the author pours so much effort into creating all these threads (ha!) then I feel more than a little obligated to keep up and hopefully not miss too much of the expertly crafted hints, foreshadowings, and references. As I have read Susan Dennard’s first series as well (and been following her on various social media) I’m quite aware how much she has grown as a writer. As another author I admire uses to say that books belong to their readers I’m not usually a fan of authors chipping in after the fact to add tidbits or explain their intent – if it’s not on the page it’s not in the book. BUT (all rules have their exception and some rules are made to be broken) if an author realises that he or she has mucked up in terms of representation or somehow else steered in the wrong direction and not only owns up to it but promises to do better that is something I am more than okay with. 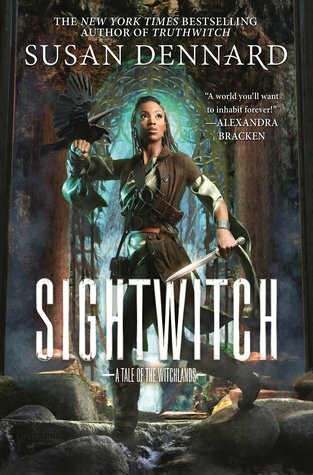 And with Susan Dennard especially I not only believe that she will do better but I know so because her work on improving her craft is evident in how much she grows between each individual book. What are your thoughts on authors chiming in on their books after the publication date? Share your thoughts and teasers in the comments! You raise a really interesting issue here, Julika. I have really enjoyed this series so far, having read the first two books. As an author myself, I'm guessing that Dennard has a TON of material that she has amassed in creating her world and given the success of the series and the strong response of her fans, has decided to produce some of it in book form to give readers more of a glimpse into the world. I'm delighted you are finding it such a rewarding experience. Windwitch is coming up on my calendar. I enjoyed the first book in the series. I'm glad you enjoyed the 3rd book. I'll get there someday. This week I am spotlighting Hooked on a Phoenix by Ashlyn Chase. Happy reading! This series is on my TBR, but it's going to be a while before I get to it. The book sounds really cool in appearance. My Teaser is from a short mystery story, Diamond Girl by Julie Mulhern.